Republican Scott Milne speaks Saturday as he formally kicks off his campaign for U.S. Senate in the town of Washington. If Vermonters elect Scott Milne to the U.S. Senate this November, they will send a message to the nation that voters are fed up with professional politicians beholden to special interests, the candidate said Saturday as he kicked off his long-shot campaign against the Senate’s longest-serving member. Milne, a 57-year-old travel agency owner who has never held elected office, is challenging 76-year-old Sen. Patrick Leahy (D-Vt.), who’s held the seat for 42 years. Milne said he hasn’t asked anyone for money and has raised “less than $50,000.” Leahy, by contrast, has raised more than $4 million during the six-year election cycle. The candidate, who officially entered the race last May, held his campaign kickoff before about 100 supporters outside the Washington Town Hall in the rural Orange County community where he was raised. “A lot of things in Washington, D.C., can be solved with values from Washington, Vt.,” he said. Milne’s campaign offered supporters copies of the 1939 movie Mr. Smith Goes to Washington, which tells the story of a newly appointed senator who naïvely fights political corruption. “While Mr. Milne believes this race is about Sen. Leahy, Sen. Leahy believes this race is about the issues facing Vermonters,” Tilton said. At Saturday’s kickoff Milne unleashed a blistering account of Leahy’s tenure in the nation’s capital, but he outlined no issues he would advocate for if elected. Afterward, Milne said he would disclose specific goals at a press conference this week. “We have a strategy, which we’ll talk about [next] week, for putting term limits in for the U.S. Senate and the House of Representatives,” he said. 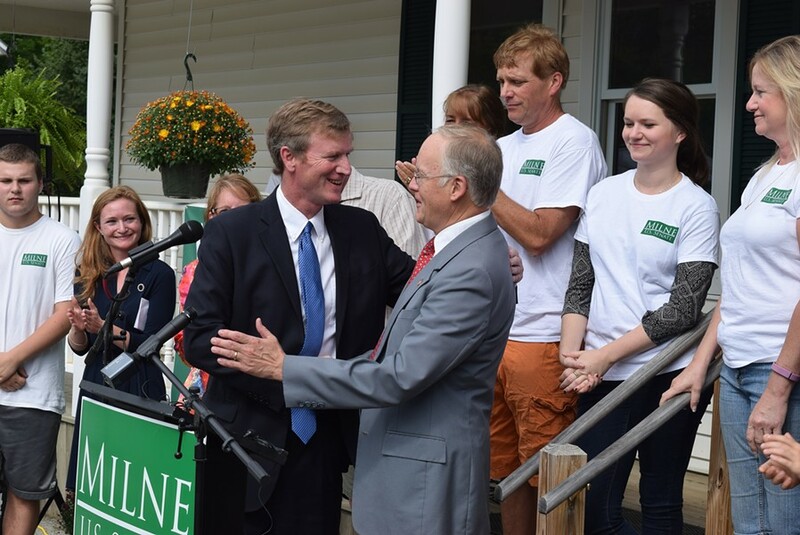 Milne discounted the value of Leahy’s seniority and corresponding ability to bring federal funds to Vermont. “I have a business background and know how to balance a budget, know how to meet a payroll. I think those assets are going to help me,” he said. U.S. Senate candidate Scott Milne greets former governor Jim Douglas at his campaign kickoff Saturday. 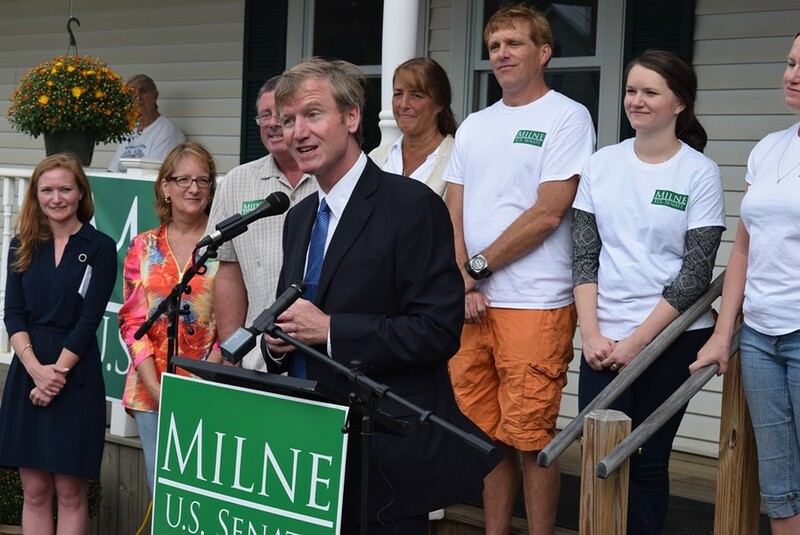 Two years ago, Milne launched his first statewide election campaign, challenging Democratic Gov. Peter Shumlin. Surprising most political observers, he nearly defeated Shumlin, who soon decided not to seek another term. Milne said Saturday that his experience proving pundits wrong had inspired him to take on Leahy. The candidate focused much of Saturday’s speech on accusations that the U.S. Senate is governed by special interests. He said Leahy was part of the problem. “The news stories of my opponent trading favors for big companies doing business with our government and then receiving donations are a sign of a broken system,” he charged. Milne said later that he had been referring to a recent Seven Days column documenting campaign donations Leahy received from a United Technologies political action committee after helping the company obtain a $15.8 million Department of Defense contract. Joining Milne at his kickoff were former governor Jim Douglas, a fellow Republican who also helped Milne launch his 2014 gubernatorial campaign, and nearly a dozen Republican state legislators. Comedian and actor Rusty DeWees warmed up the crowd, declining to officially endorse Milne, encouraged attendees to read up on both candidates. “He’s smart. At 57, he’s saying, ‘I gotta get me a job that’s Tuesday through Friday,’” DeWees joked.